LIC New Endowment Plan 814 is a regular premium paying Endowment Assurance Plan which was introduced on 3rd January 2014. It provides a combination of protection and saving features. This attractive combination provides financial support anytime before the maturity to the family of a deceased policyholder. On survival of the policyholder, this LIC Endowment Plan 814 provides good lump sum amount at the time of maturity. It also provides many profits and benefits to the policyholder. The benefits, eligibility and other details are provided below. Where, ‘Sum Assured on Death’ is 10 times of annualized premium or higher of Basic Sum Assured. This benefit shall not be less than 105% of total premiums paid as on date of death. Where all these premiums exclude extra premium, service tax and rider premiums, if any. 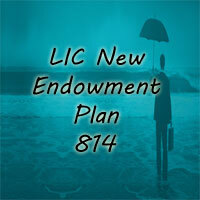 LIC New Endowment Policy (Plan 814) provides optional benefit namely LIC Accidental Death and Disability Benefit Rider. Loan: After paying premium for 3 full years, policy holder can avail the Loan Facility under this plan. The eligibility conditions for basic plan is as follows. Note: The Basic SA (Sum Assured) shall be in multiples of Rs. 5,000/-. The Entry Age for the policyholder taken as age nearest birthday except the minimum entry age (8 years). With the payment of additional premium you can get the optional rider under LIC New Endowment Plan namely LIC Accidental Death and Disability Benefit Rider. On death of a life assured due to the accident, an additional amount equal to Accident Benefit Sum assured is payable along with the death benefit, provided the rider (optional benefit) is in force at the time of the accident. On accidental permanent disability of a life assured (within 180 days from the date of accident), an amount equal to Accident Benefit Sum assured will be paid in equal monthly installments spread over 10 years and future premiums will be waived off. With the help of LIC Premium Calculator you can easily calculate the Premium amount, Death Benefit, Maturity Benefit, Rider and other factors of LIC New Endowment Plan 814. To calculate the premium amount, maturity you need to enter some values such as Policy period, Age and Sum assured. LIC New Endowment Policy completed under CEIS (Corporations Employee Insurance Scheme) will be eligible for this CEIS Rebate as a percentage of tabular premium of Basic Plan as well as AD&DB Rider Premium. Suicide Clause: If the life insured commits suicide at any time within 12 months from the commencement of risk, then the company will not allow any claim under this LIC New Jeevan Rakshak 827 Plan. Instead, he/she will be returned back with 80% of premiums he paid excluding any taxes and extra premium if any. Cooling-Off Period: You may return the policy to the corporation within 15 days from the date of receipt of the policy in case of dissatisfaction with policy conditions and terms. Back-Dating Interest: The policyholder can backdate the policy within the same FY (financial year). Back-dating interest as applicable at the time of policy completion. The charges will be applicable for the period in excess of 1 month. Policy Stamping: Policy Stamping Charges = 20 paise per 1000 of Basic Sum Assured under this LIC Jeevan Rakshak Plan. Assignments/Nominations: As per section 39 of Insurance Act, 1938, at the proposal stage a nomination can be made in the policy . As per section 38 of Insurance Act, 1938, on a subsequent assignment, the notice of assignment or change of nomination should submit to the corporation for registration. Proposal Form: Proposal Form Number 300 and 340 may be used under this LIC New Jeevan Anand Plan 815, which is subject to change. What is GSV and SSV?